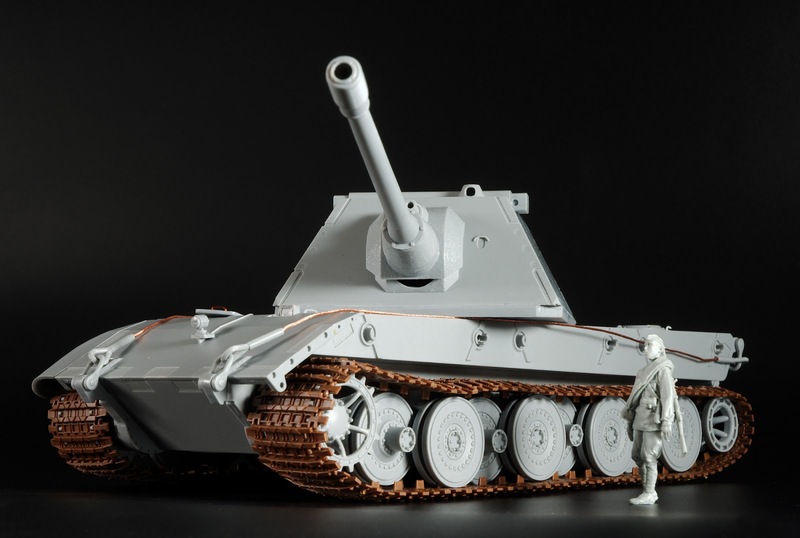 All those people who love "World of Tanks" and some of those modellers who like heavy armour in 35th scale will team up with the "What-If" crew for Amusing Hobby's latest release due in September. 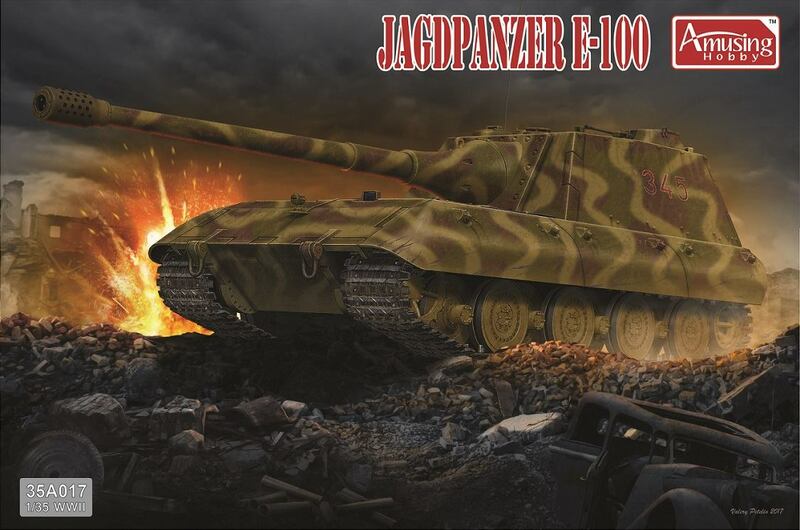 The Massive Turretless tank destroyer the Jadgpanzer E-100 "Jaegeroo"
Now let's get this straight from the off - This vehicle never existed even as a blueprint. 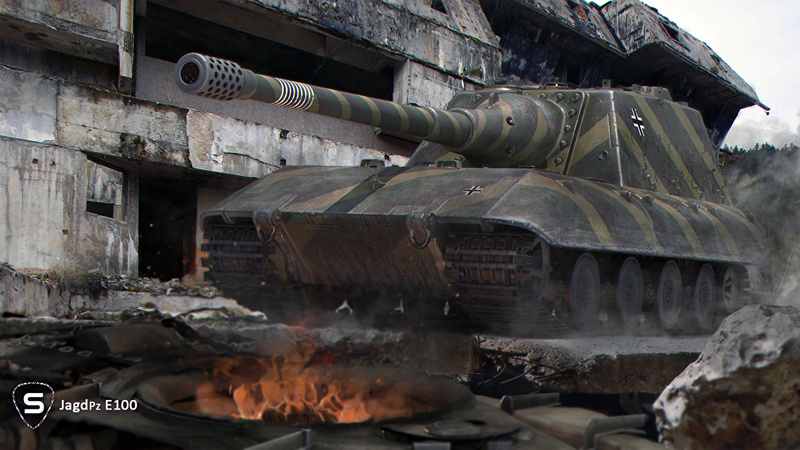 The E-100 was only considered as a turreted tank and as a tank destroyer as a Stug with either a 15 or 17 cm gun. 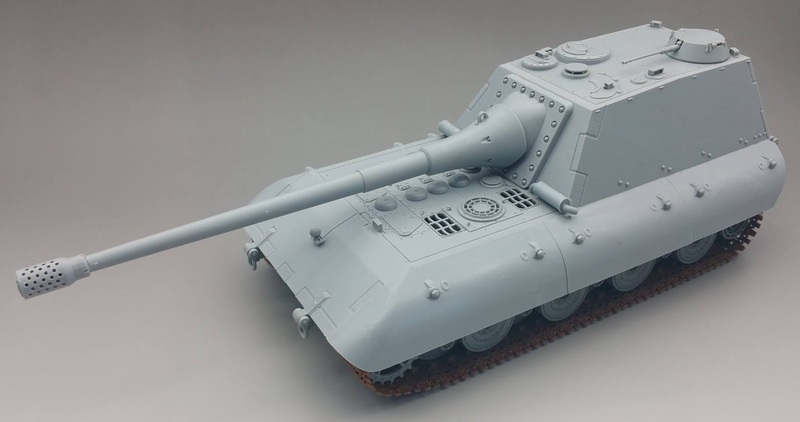 There are other mooted plans for this vehicle, and models - of a self-propelled gun, an anti-aircraft vehicle, and a tank destroyer. However, development was never started, and only a hull of an E-100 was ever made as a prototype. 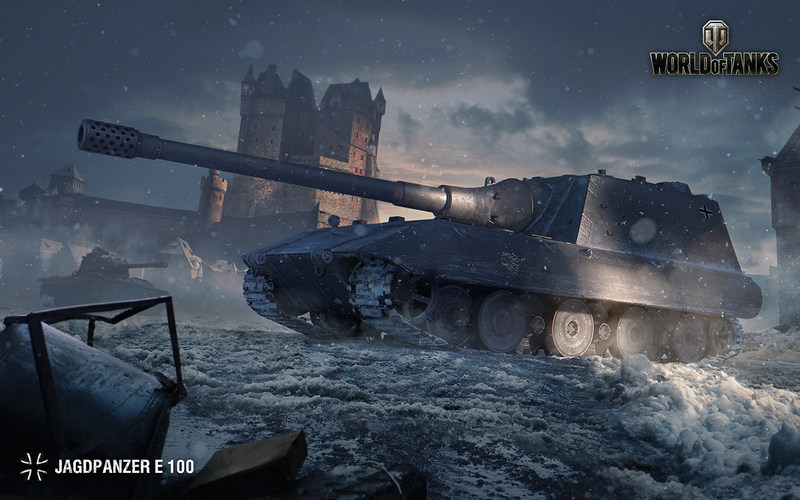 In the game "World of Tanks" the JagdPanzer E-100 is a Tank Destroyers also known as "The Mighty Jaegeroo" or "The Broomstick of Doom", Anyone who has been struck by the massive gun of this tank,and surprisingly lived to tell the tale, will warn you to steer clear of it, if it happens to find you. 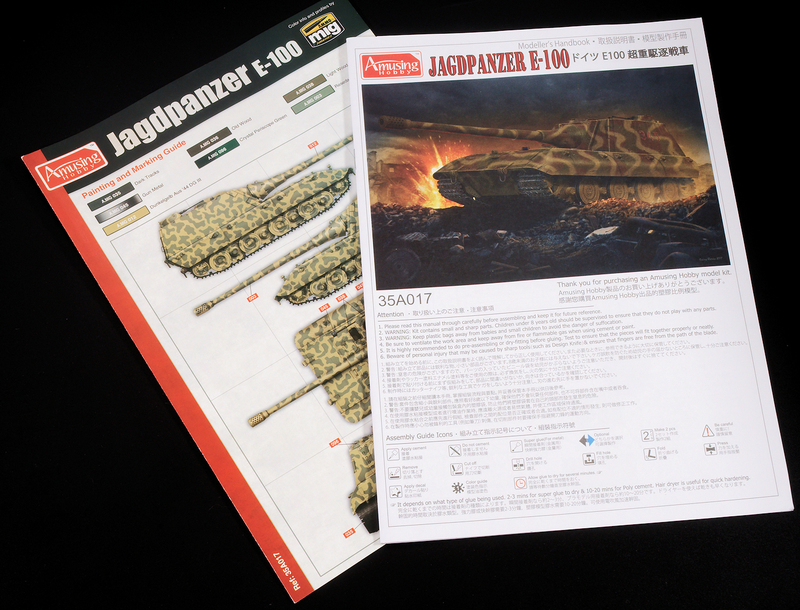 The Jagdpanzer E 100 marks the end of its German tank destroyer line. 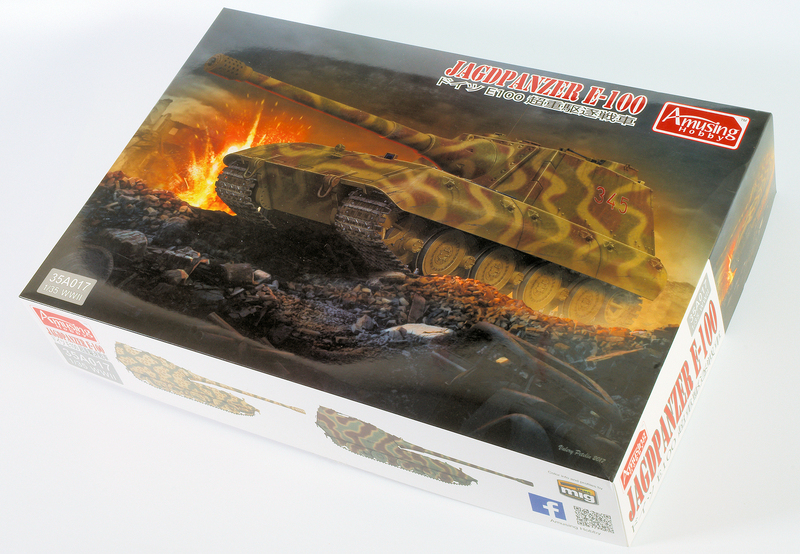 In the game, this tank features a massive 170mm cannon, and it is popular if flawed design. 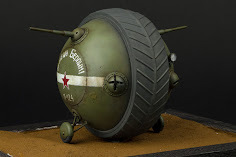 The strong frontal armour and high penetration of the gun is foreboding, but it's non- turreted design would have enabled enemies to flank and surround it. 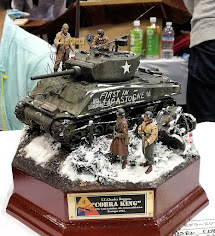 A little like what might have happened if this tank was ever made in real life. 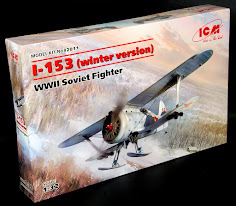 Now one thing we can say exists in real life is this kit - and having made it's "Little Brother" from Amusing Hobby, we can say that we have identified some of the similar characteristics of this model, and how they are used on this kit. 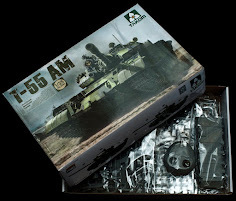 This kit comes in a large dark clad box on the front with some very dirgy looking artwork, there is nothing wrong with the artwork, but it would not really grab my attention at all amongst some other kits out there, maybe showing it firing would have drawn some more colour and light to the look? 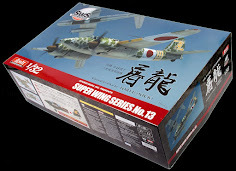 The box is fairly full of sprues, indeed some ingenious packing was needed to get it all in there, the hull upper and lower halves neatly divided at the wheel line dominate this kit when you open it up. 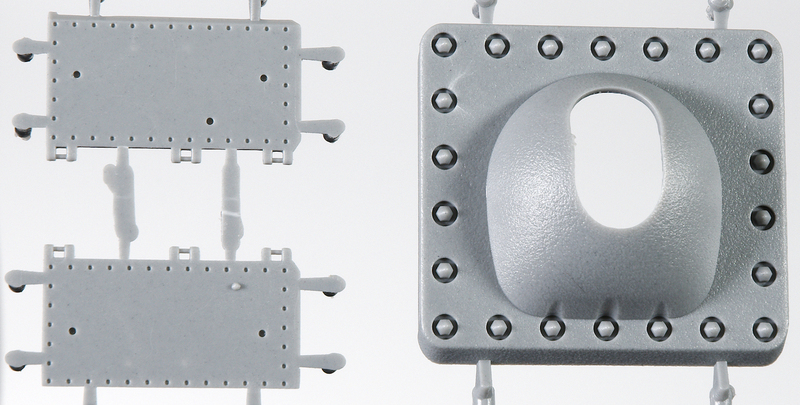 There are six sprues in medium grey plus the upper and lower halves, five in brown plastic for the tracks and springs of the suspension in addition to the small photo etch sheet and decals sheet of about the same size. 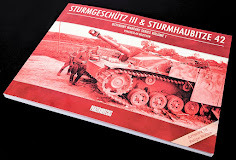 There is also a full-colour booklet with the colour schemes and of course the instruction booklet. 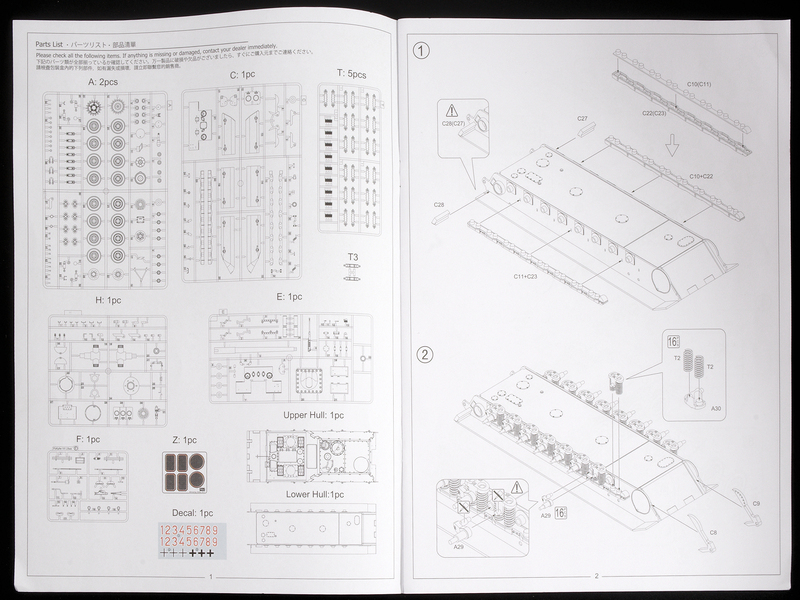 The instructions are in the simple to read style that Amusing Hobby doe so pretty well. 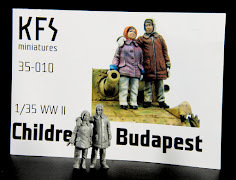 Thier kits often match this simplicity, but with a greater detail than you might expect moulded into the minimal part count. 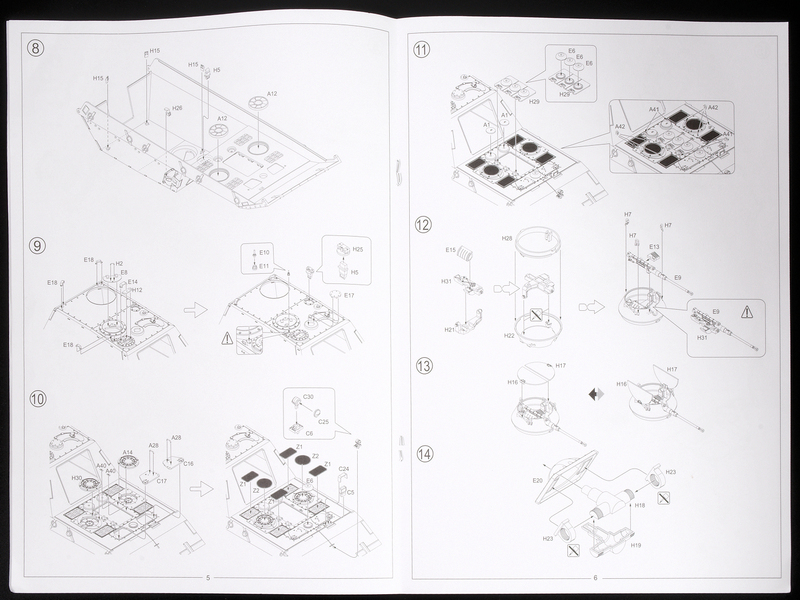 There are only twenty steps in nine pages of the black and white (with colour cover) instruction booklet. 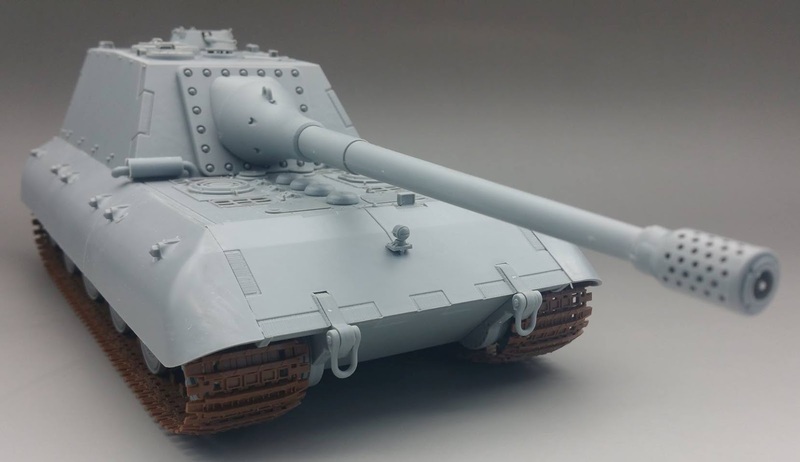 While we are talking about the tracks we noticed that they were the same type as the E-100 heavy tanks, simply clicking into each other to form a working track. I am not sure if they are made of a slightly different plastic - but these tracks seem to sit together a little better once clicked together. We have already made two runs of them at 102 links each side. 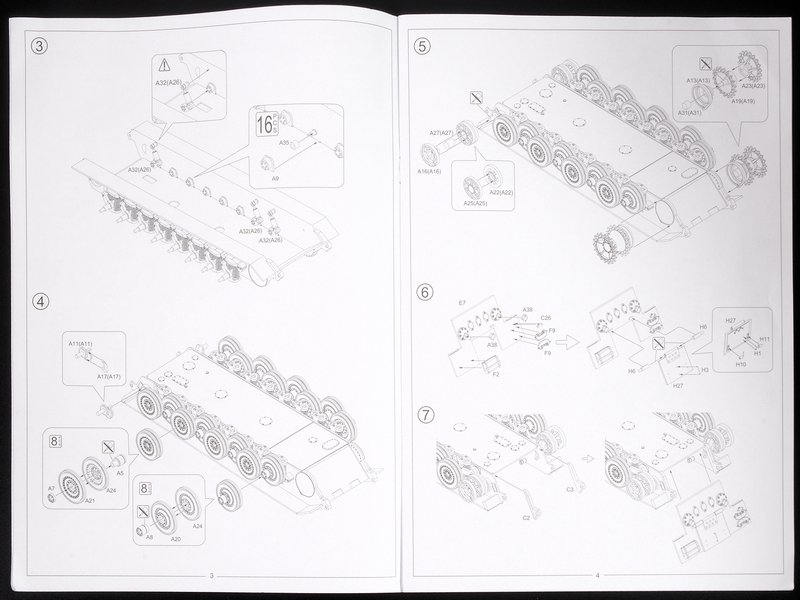 The bag of trackpads are joined to the insides of each track in a simple construction, you may even notice the slightly more difficult part of the suspension is that coils that are needed to support the vehicle over all of the lumps and bumps. They are a little bit more of a delicate removal, needing to be snipped fairly close to the coil and then sanded round. I do this by sitting the coil on something circular of the same diameter and then anding it so that the coil does not break. 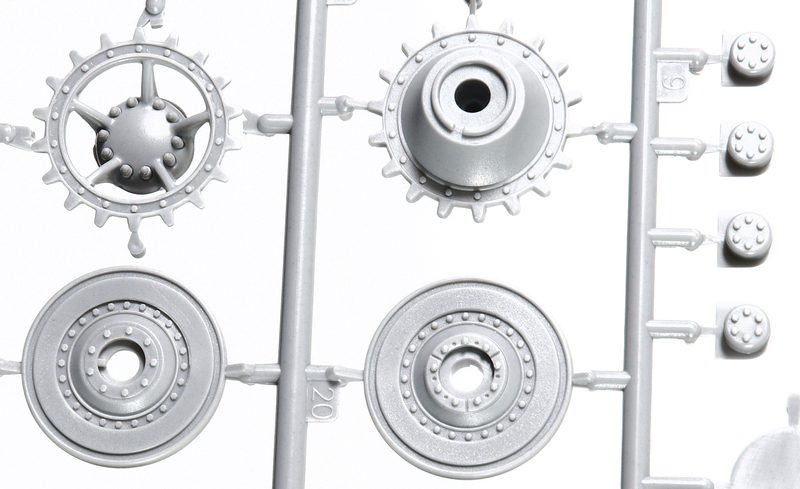 Sprue A has two of the same runners - these two duplicates house the several paired up and slightly interleaved steel roadwheels, the wheel arms that pivot and move with the coiled suspension when it is all built, the drive sprocket and final drives and return rollers, also the rear deck's plumbing and exhausts are all here. 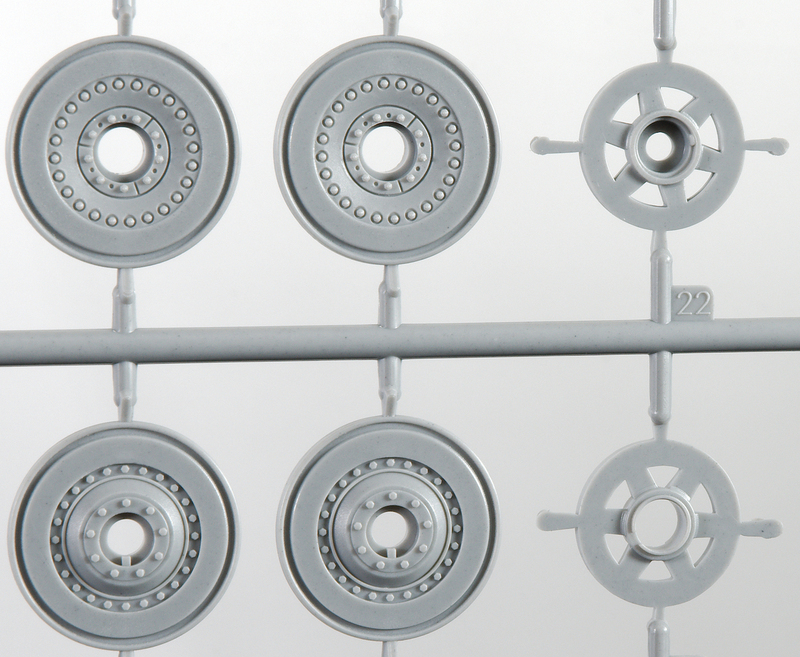 Sixteen roadwheels on each side, doubled up and overlapped by a third, these are well represented on the kit with hex detail on the bolts of the wheels. 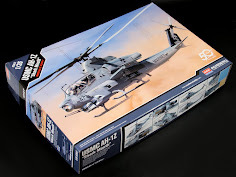 The rear deck's exhaust fans are all here and the exhaust shrouds themselves are from the MBT kit and not applicable here because the engine deck is situated on the front of the kit. An alternate exhaust shroud is given, and it vents out at its position on either side of the front glacis. 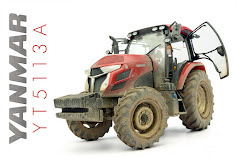 Kinda looks dub to me, I would take the soft option and make some other solution for venting the exhaust fumes. It is here however if you want to use that option. A close look at the other side of the steel road wheels (nice nuts) and the return rollers which join together to encapsulate the tracks inside the space created. The drive sprocket joins together on the seam in the middle - we will check to see if these are aligned before we seal them up as the E-100 we made were not aligned correctly if the notch was to be believed, we will let you know on this kit int he build. 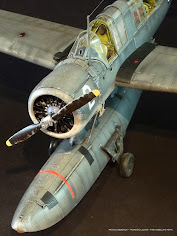 The suspension upper encasements (?) and the swing arms for the wheels to sit on are here in close detail, no seams to be removed is nice, and the shackles for the towing hooks and the cut notches they sit inside are here also. 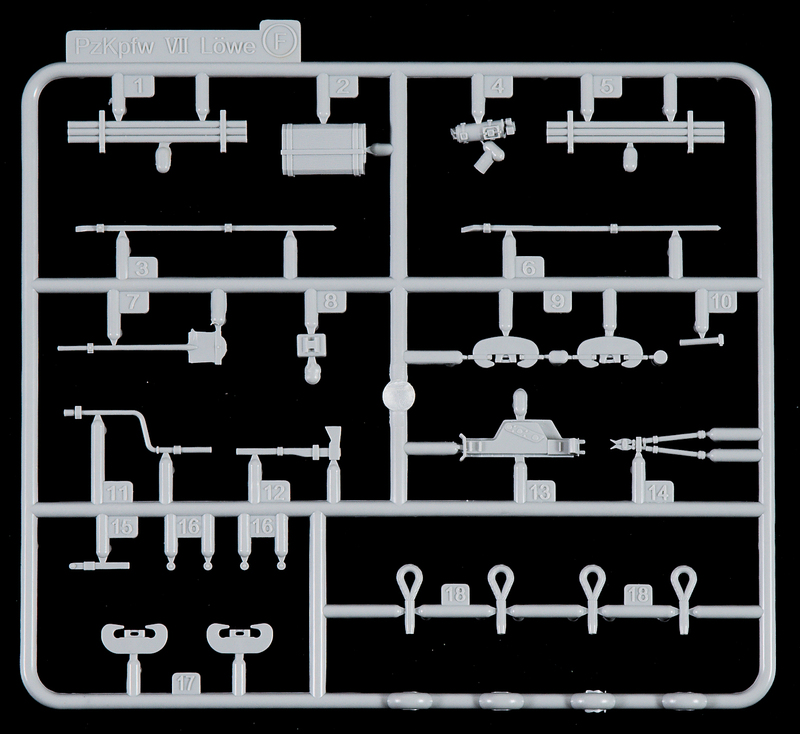 Sprue B is next - a single sprue with the rear plate for the Heavy tank version we will not use for this kit, the two long upper suspension mounts that the coils rest upon. The hatches and engine door, as well as the four big towing points, are on the top left of the picture. 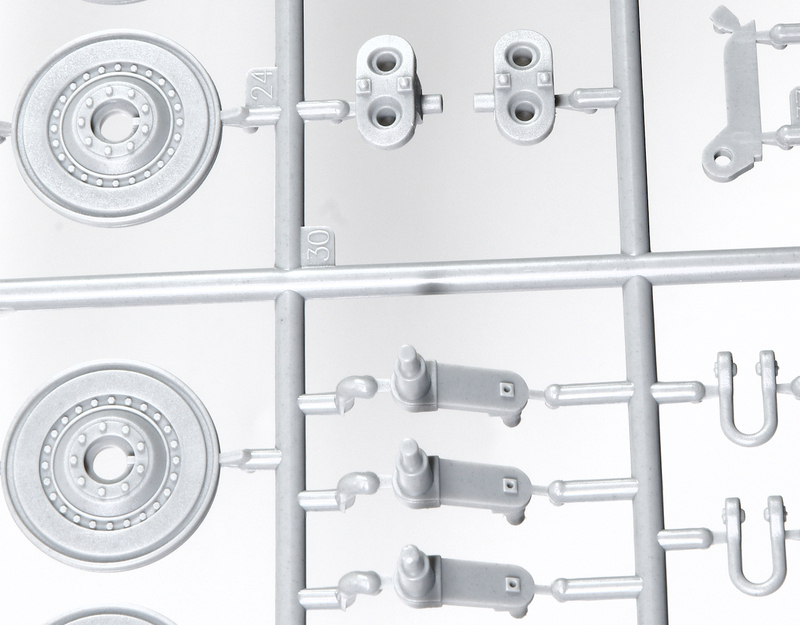 The sprue is dominated, however, by the two side of the large sideskirts. These six large parts are each moulded in a single shot, they join to the hull, but with glue, the lugs do not hold them there permanently. 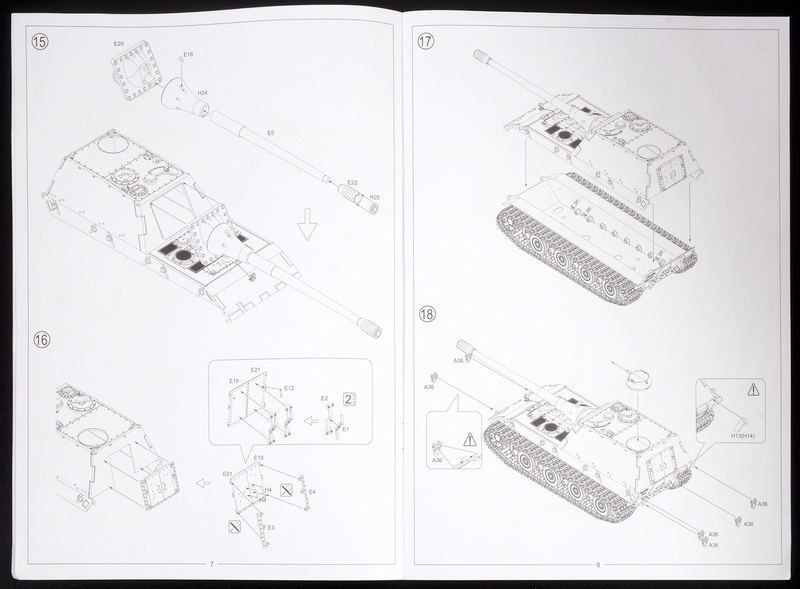 You will need either glue or a method to remove or replace them like we did with the heavy tank E-100 we built. You can choose to have these skirts on or off, or partially on or off depending on your choice and your imagination. 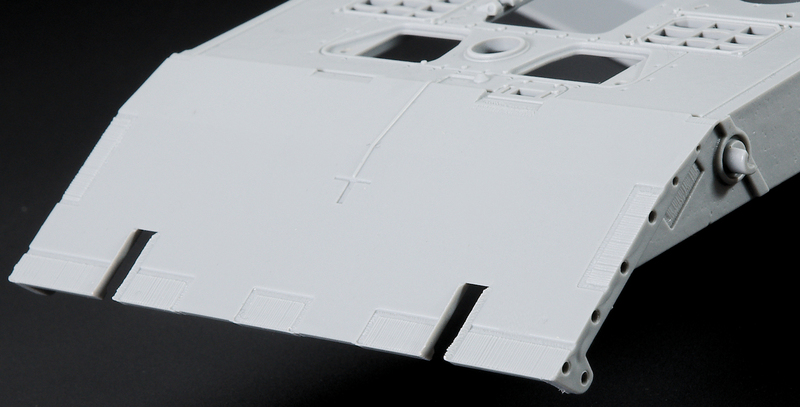 The side skirts are textured lightly in a cast finish. 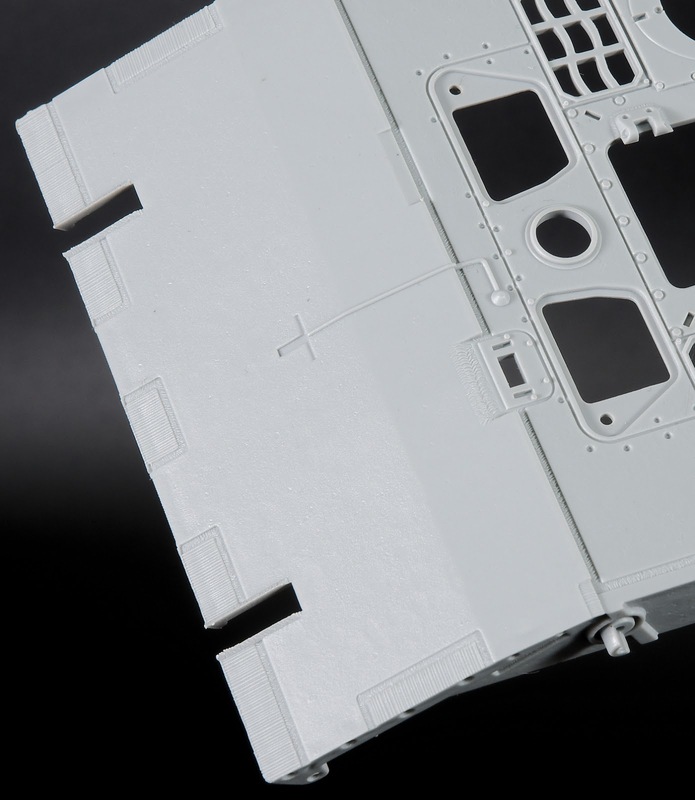 You see here a little bit of flash on the insides of these side skirts, pretty much the only bit we found on the kit - the moulding is smartly executed, especially with some of the larger one part pieces that many companies would never make. 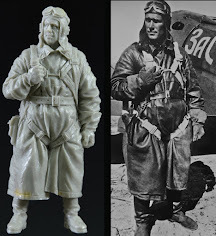 The simple manufacture of the kit from these large moulded parts that do not need a gallon' o' glue and a large parts count is a bonus to the modeller. 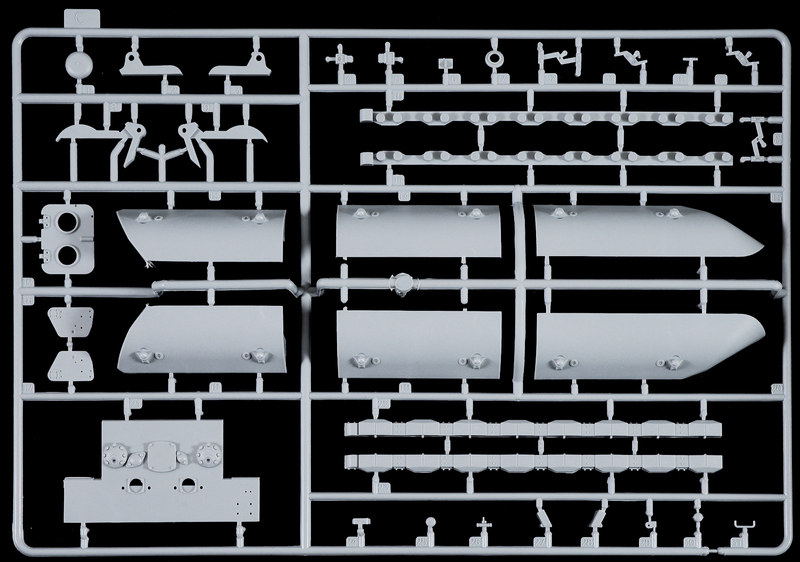 Sprue E is a single sprue again, with a lot of the front and rea this time, the main armament is seen here in a single piece barrel, the rear hull wall and doors that can be posed open or closed, the front mantlet with heavy casting texture and some other minor details. The barrel of the big gun, the biggest we have seen so far of all the Amusing Hobby tanks, it is notched so you can only insert it int he mantlet on easy, and the slide moulding technique allows us to have a single parts that do not need to be glued together. 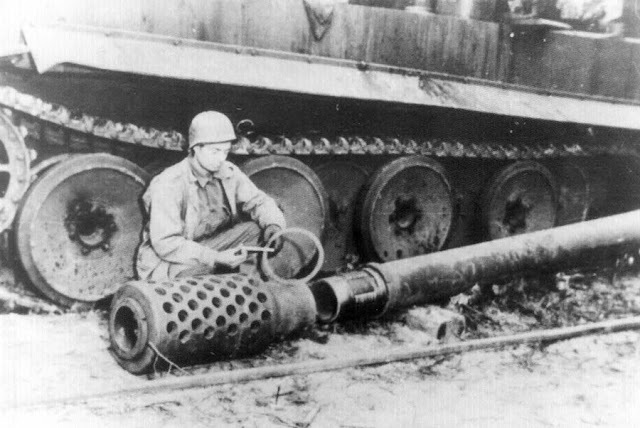 The barrel is topped by the muzzle brake which is very similar looking to the 12.8 KwK gun that was to be to be mounted on the E-100 although rather simplified in this instance. The brake is at least flash free and a good alternative if you were not planning to upgrade with a metal tip. 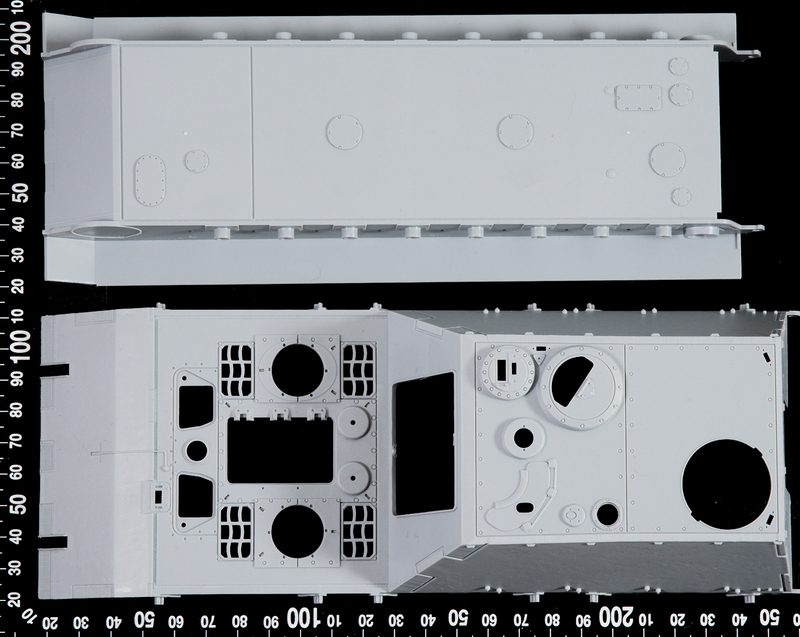 The rear of the hull superstructure is a large slab that some of the tools are added on to, seeing there is no exhaust there to take up the rear deck this space is great for those items normally stored on the deck of the tank. The textured stubs that the exhausts normally comes out of are covered over with parts supplied in the kit. 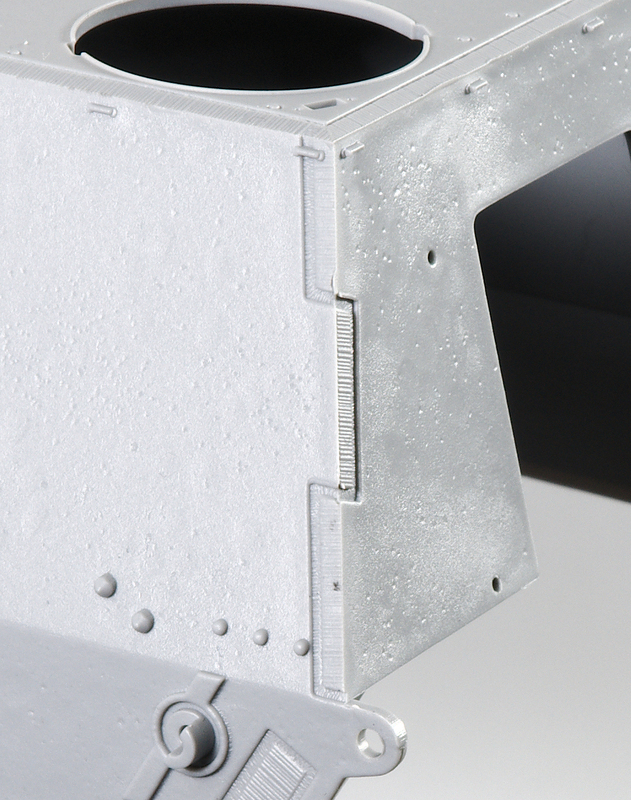 The mantlet for the gun is the heaviest textured part of the kit. The hex bolts that secure it in place. The rounded but pointed bolts are just the right types you might come to expect by looking at the artwork of the "real" thing. 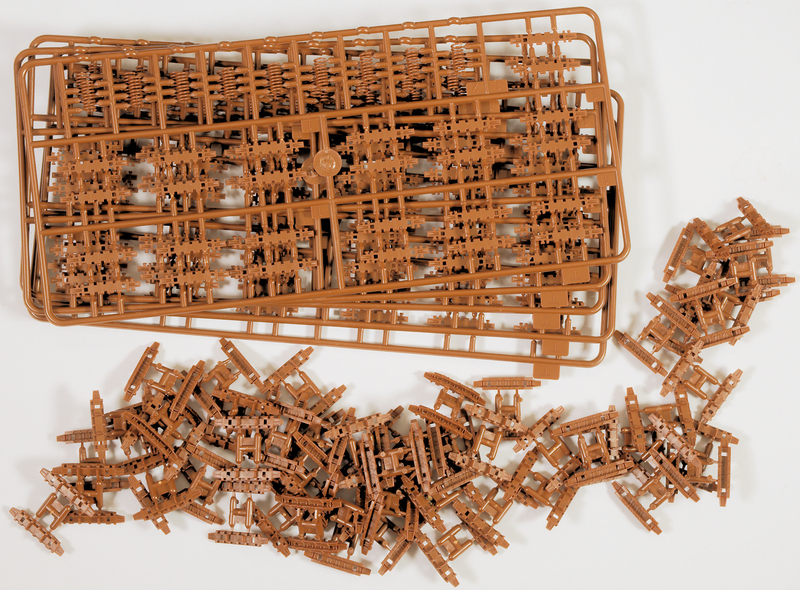 after you remove the mantlet from your sprue runner you will be left with four snip marks which you will have to re-texture yourself. 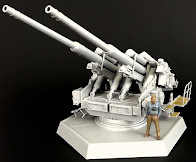 Another very nice part of the kit is the large self-defence cannon (it looks like the 37mm cannon from the cooling jacket on the muzzle) this sits inside a flat turret cupola. Notice the very nicely hollowed out barrel and the vented muzzle brake. 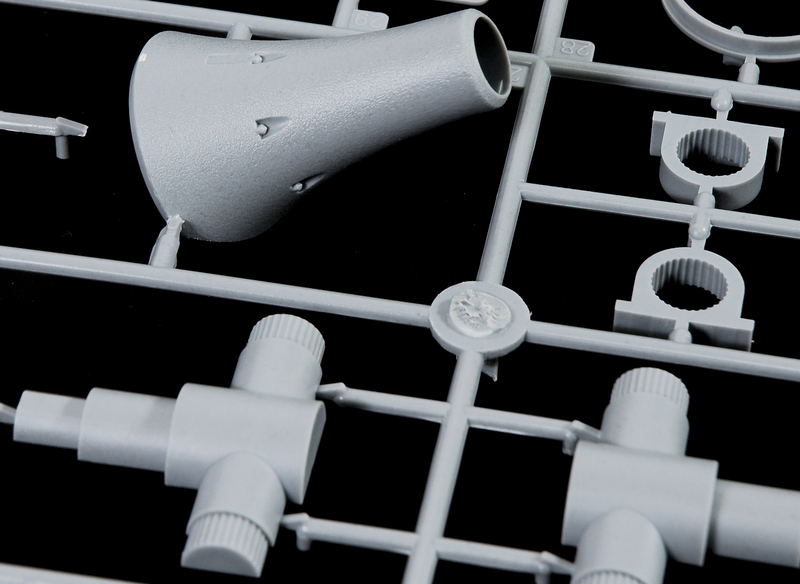 Sprue H is the last for this kit - and the large base of the barrel and the simple swivel point that it sits inside in the turret casemate. 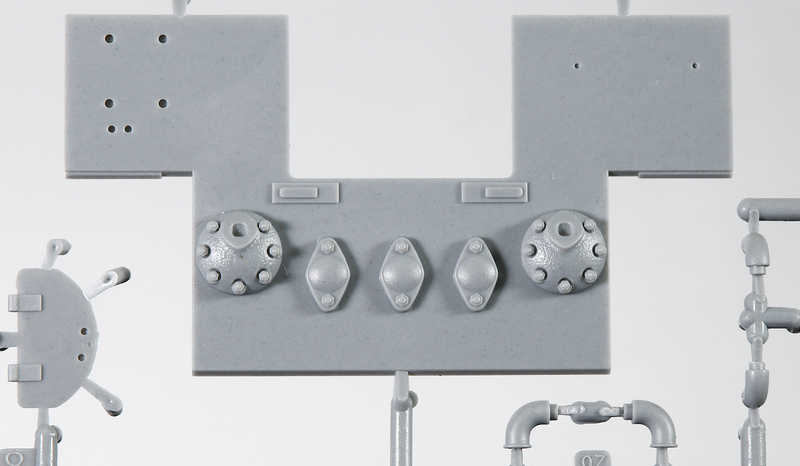 The turret gun cupola and several other of the hatches, hooks and handles are on this sprue. 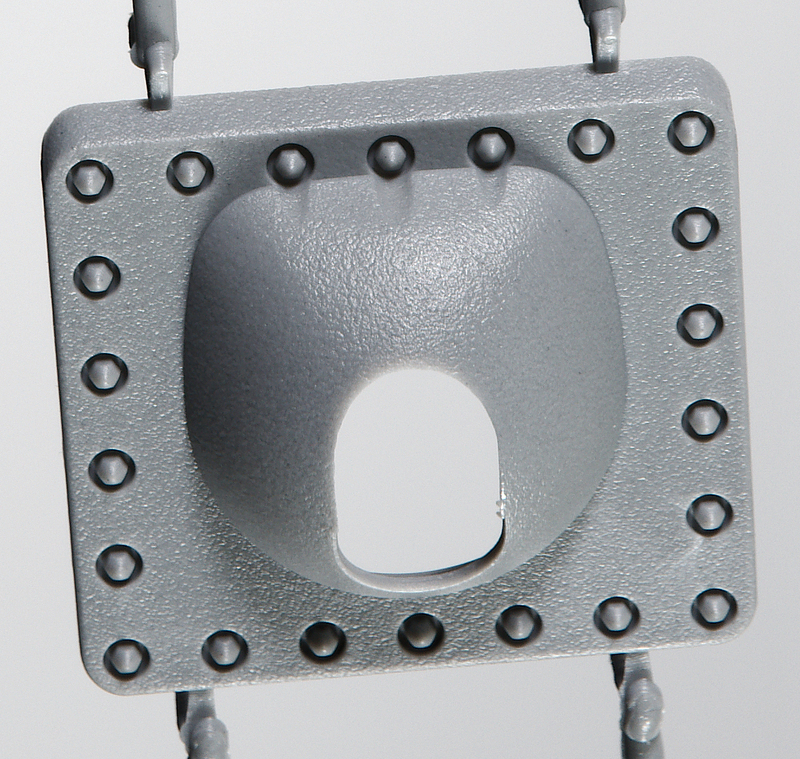 The gun mount that attaches to the rest of the mantlet part is here below, in a textured plastic that matches the cast steel look of the rest of the mantlet, the swivel part is below along with the socket that sits inside the superstructure wall. 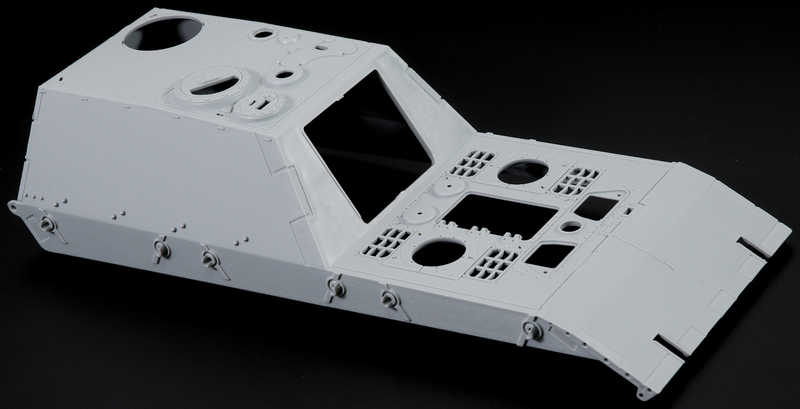 The thin top cupola parts for the self-defence cannon are here. 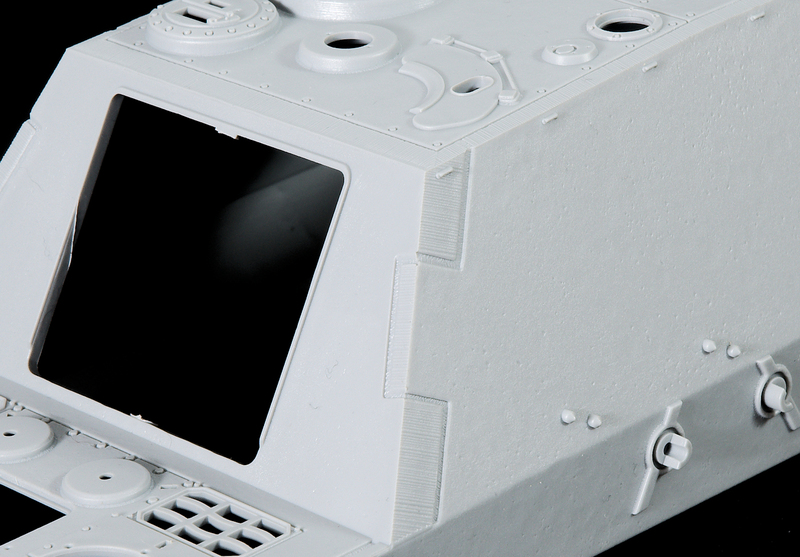 The hatches can be opened to show the gun, but not much else as the kit is bare inside and there is no room for the crew to even pop their head out. The pioneer tools for the kit have some interesting parts you can add, but no tow cable, no tow hooks that fit the shackles of the kit unless you break them and then fix them back together. Seeing we have had a few of these large kits I would expect more than the copy of the Lowe kit's pioneer tools. The second largest part of the hull is next. 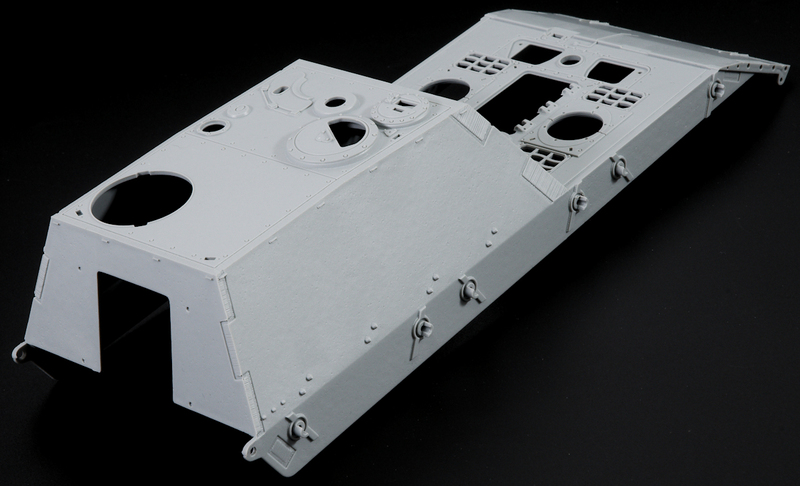 The bottom of the hull is seen in one large piece that simply fit to the upper half horizontally and avoids most of the open seams that can be a problem for those just wanting to get things together seamlessly and fast. 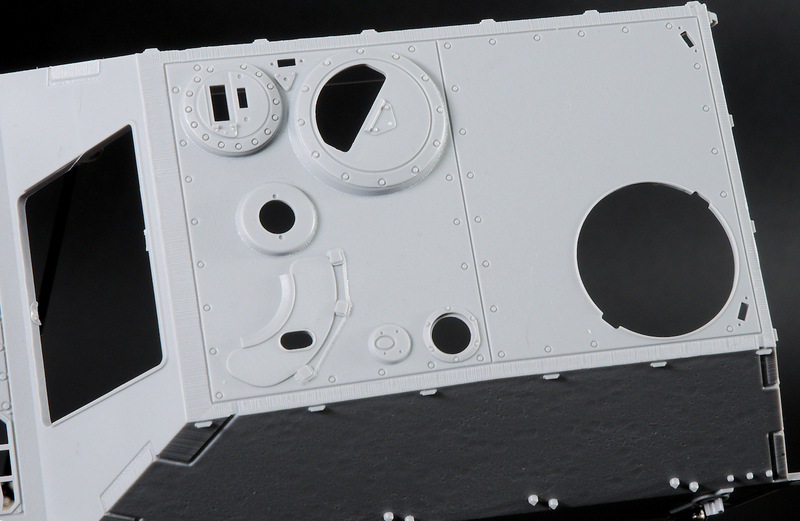 Below that is the last but certainly not the least part of this kit - the upper hull casemate. 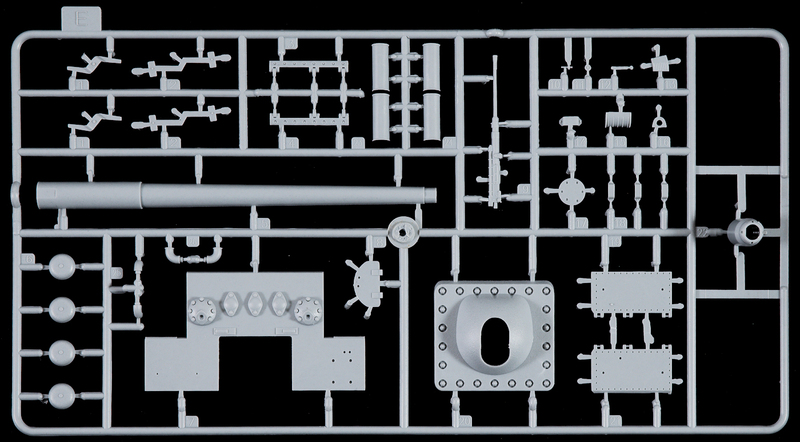 This is the biggest single part of a kit that I have seen for a while, I never would have thought that all of this plastic can be moulded in one "shot". Those with sharp eyes might notice the really nice pitted and slightly bumpy surface texture all of this to replicate rolled steel. 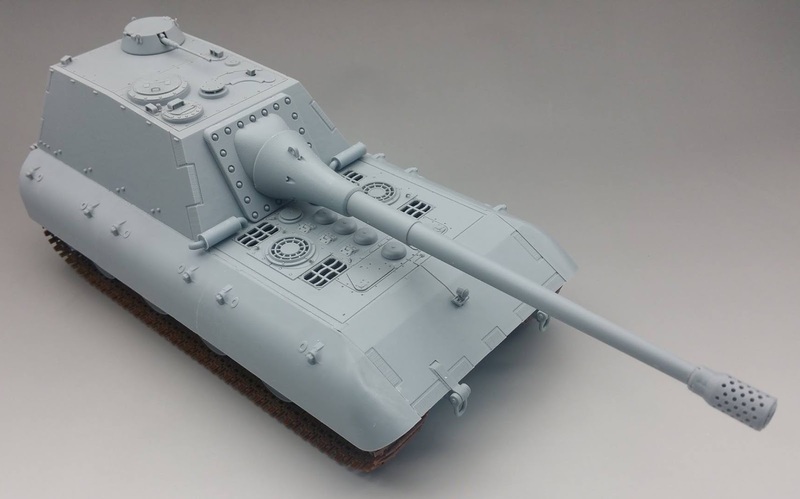 IT will look great under a wash and subtle weathering. 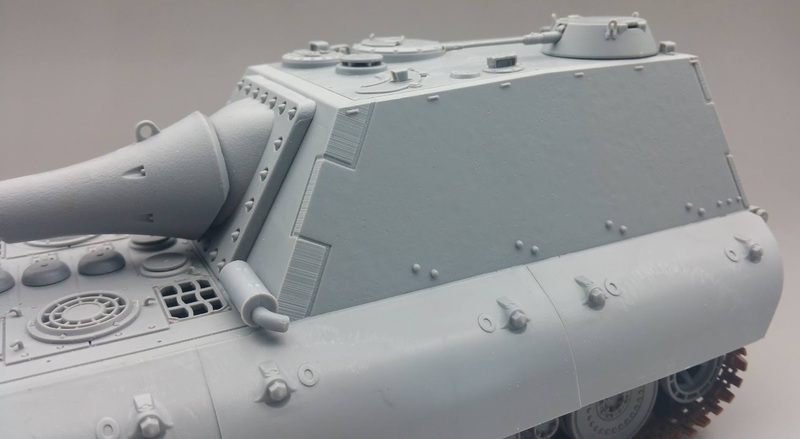 The large slabs of the steel where it is joined are very thick, and as the other part of the kit's surface detail, the welded seams is another great feature that can get a realistic heavy weathered look in the right hands. The front glacis area is one of those places the pitted surface rolled steel and the weld seams come together to look very much like a roughly finished heavy tank, put together under the pressures of war. The sides of this upper hull show us a "short shot" maybe, with some of the slight cavity left that might need some filler to square it off. if you choose to have the sideskirts left on you only need to glue this all up. 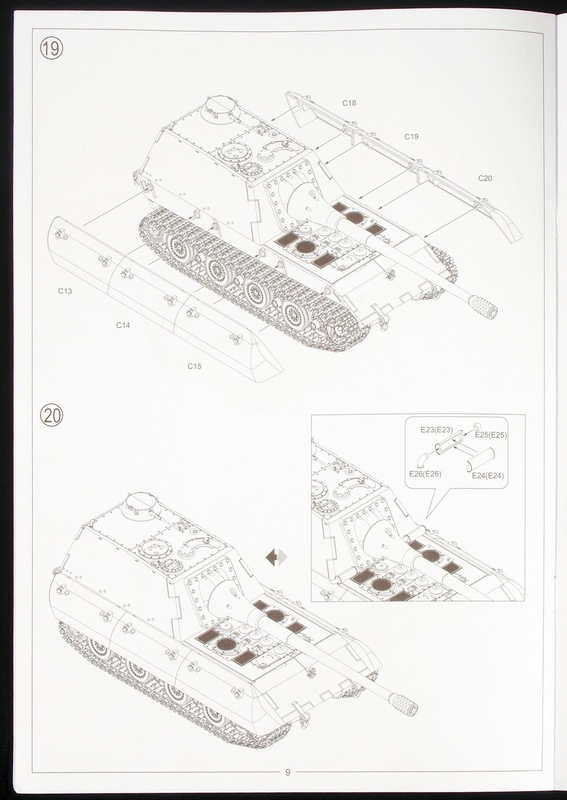 The channel down the middle of the glacis plate is for the round headlight that can be installed or left off depending on if this tank was actually in action or not. The lovely weld seams here make up for it, don't they? 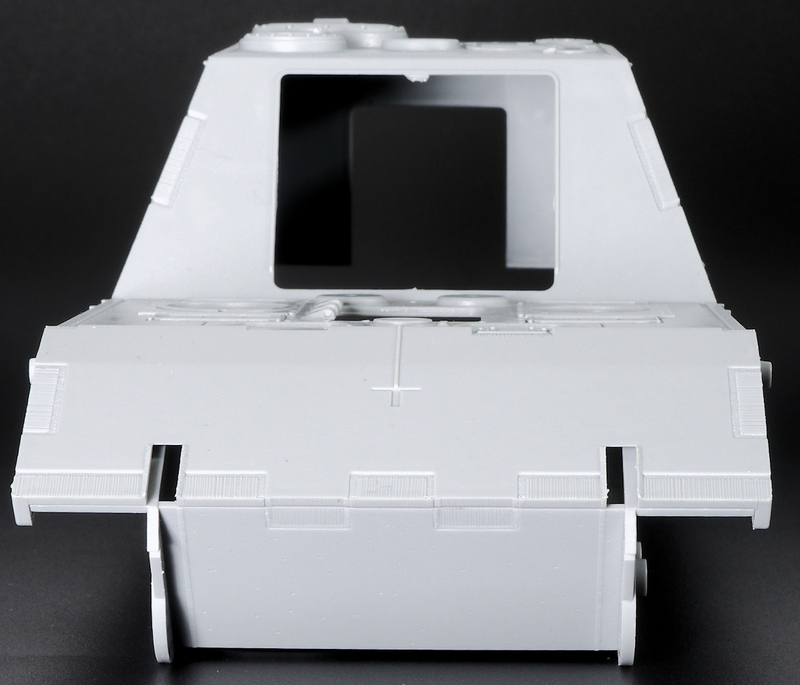 The top of the superstructure has the large circle o the rear for the self-defence mini turret/ cupola, the other hatches and vents - close these up if you do not have a figure to block up the hole. It is a BIG empty space inside otherwise. Me, I like the kit to be as simple inside if I am not showing it off. 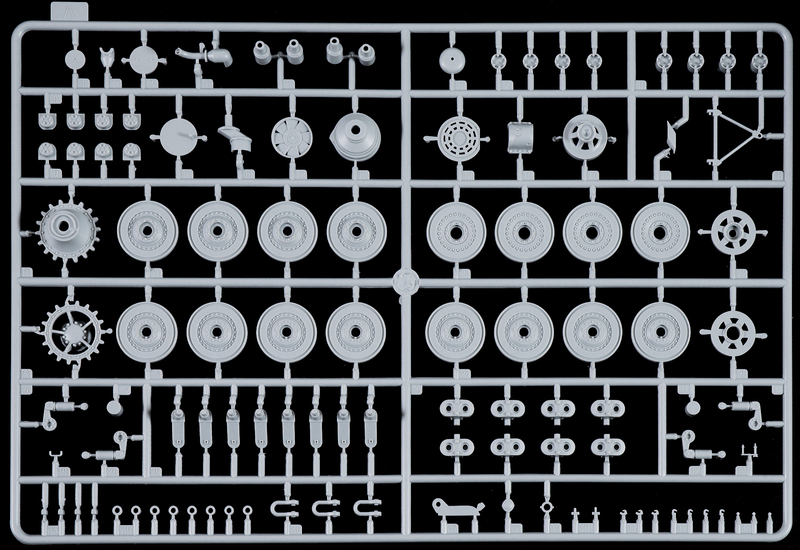 The photo-etch for the grilles of the engine deck are included - also the generic decal sheet, I would like the one that has some different styled numbers on it if possible, as I now have a few of the same with the few amusing hobby kits I have made. These numbers match the several colour schemes provided from the AMMO team. 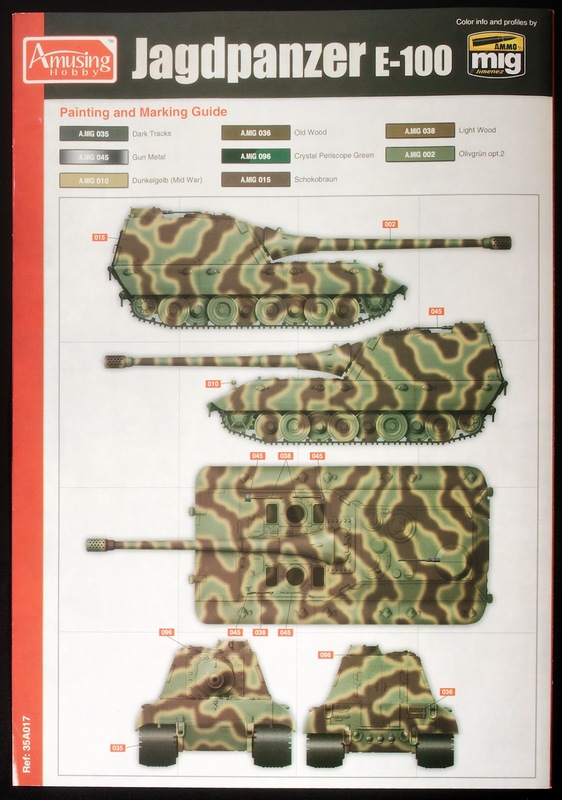 Several "what-If" schemes are provided in full colour in several views of the tank. These are a good start - but there are so many others that you could do - at least there are some good ideas in these profiles. The colours of which are of course called out in AMMO colours. So that is all that we have in this box. 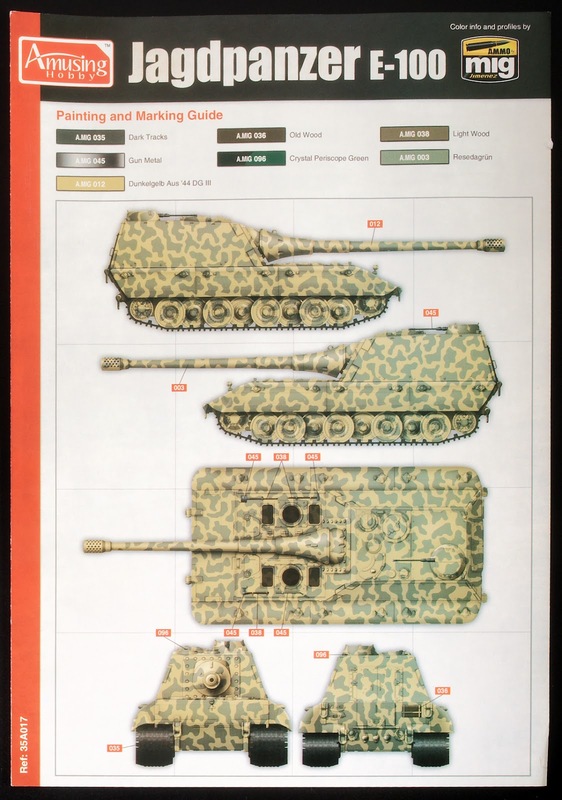 What is missing or could be added are some new tools to match this or other heavy tanks, an alternate numbered decal sheet, some towing cables as there are none in here. 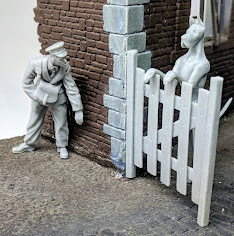 What we really do like is the simplicity and the easy build of the kit while sparing no surface detail, the moulds and lovely surface detail and the easy to follow instructions. This build will take probably only a day, so we will put it together for you this week to show you just how it all fits together. 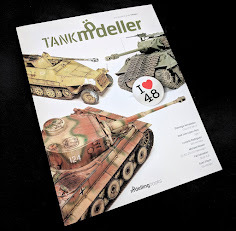 or all those heavy German armour lovers, "What-If" fans and paper panzers aficionados, this is a great kit. 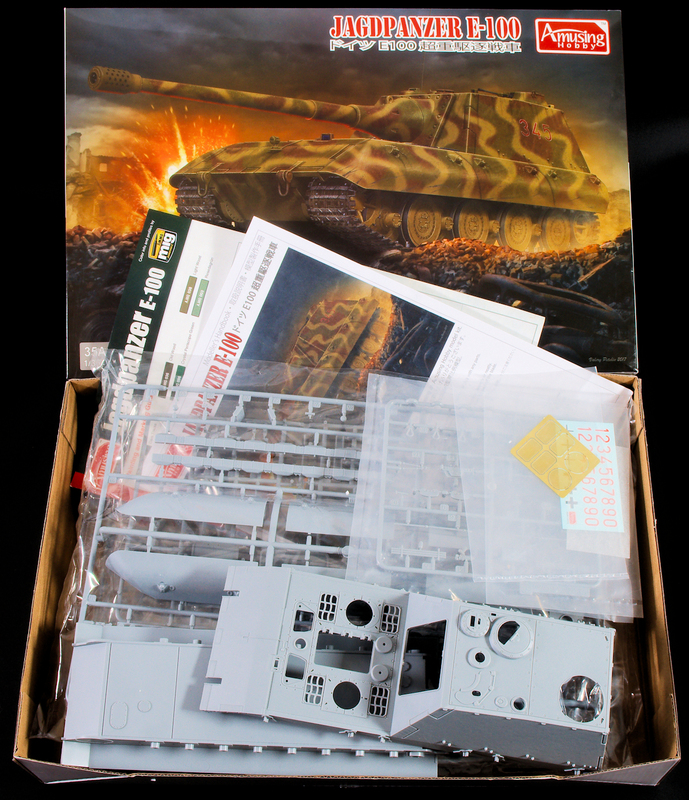 WOrld of Tanks fans will love it as well, and seeing all of these tick my box I am happy as larry with this kit. 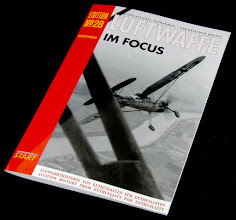 Postscript. 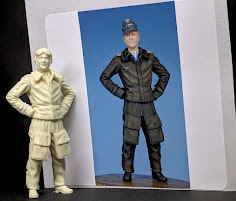 Those who can not wait to see the build could do worse than look at the test shot built up on the Amusing Hobby Website.